This is an interesting pair of Bach discs. 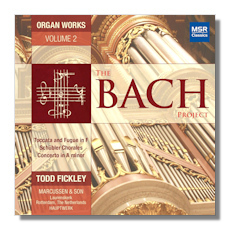 The first here is Todd Fickley's second volume of the complete works for organ. I reviewed the first volume back in 2015 and found it quite an impressive initial offering (MSR MS1561). In that review I explained the process MSR Classics is using for this series, which involves Hauptwerk technology, an ingenious means of employing pre-recorded sounds from an organ for performance or recording. You may want to check that review for a more thorough explanation of this technology, as well as for biographical information on the artist. At any rate, Fickley again demonstrates that he is not only a dependable Bach keyboardist but a subtle and sensitive one as well. In the C major Prelude and Fugue (BWV 545) he captures the sense of grandiosity in the Prelude alright, but doesn't overdo it, eschewing huge washes of sound that might muddy the waters. His voicing and contrapuntal lines are always clear, his digital work here and in the Fugue nimble and masterly. His account of the Ein Feste Burg and Nun Danket Alle Gott Chorales are fairly straightforward and restrained but intelligently phrased throughout, nicely revealing the greater subtlety of the latter piece. The Trio Sonata (BWV 526) gets a brilliant performance from Fickley, again with a slightly understated approach. Whenever I listened to the first movement I couldn't help but hear the music as a foreshadowing of Robert Schumann. Maybe I'm alone in this observation, but there it is. The other chorales – that is, the six Schubler Chorales – are perhaps the most colorful pieces on the disc. Each is a transcription of a cantata movement but Fickley makes them work just fine on the organ. Fickley highlights the somewhat exotic character of the first two and always manages to sensitively convey the mood of each piece, from the somber reverence of the Meine Seele erhebt den Herren (No. 4) to the playful and cheerful character of the ensuing Ach, bleib' bei uns Herr Jesu Christ (No. 5). The rest of the program here is presented with the same skill, the same scrupulous attention to detail and the same technical assurance. As noted in the heading, the organ used here is the 1973 Marcussen & Son Organ, at Rotterdam's Laurenskerk. This church organ has a magnificent sound, and it appears once again to be captured brilliantly via the Hauptwerk technology. That said, I slightly favor the organ used on the first disc, the Schnitger organ from Sint-Michaëlskerk, Zwolle, Netherlands. The sound reproduction by MSR Classics is vivid and well balanced and the album notes by Fickley are very informative. Strongly recommended. 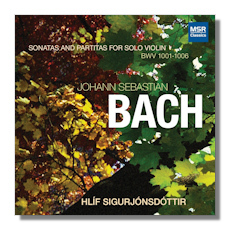 Now for the second release here… Bach on the solo violin is obviously quite a different matter from Bach on the organ. Many listeners find a solo string instrument rather barren in sound, inadequate without piano or other accompaniment. But if any composer could change that view, it's JS Bach. The solo sonatas and partitas are masterworks of course, full of subtlety and expressive depth. Interpreting these works is a great challenge to any violinist taking them on, and Hlíf Sigurjónsdóttir is fully up to the task. Actually, these performances are reissues, having appeared on an HBS CD in 2009. That recording was reviewed here by colleague R. James Tobin in 2010. I concur pretty much with Mr. Tobin's very positive assessment of the performances on that recording, and so I refer the reader to it (HBS 3). Let me merely add that this set of the sonatas and partitas could fully satisfy many listeners as one of several important reference sets in these monumental works. Ms. Sigurjónsdóttir plays with an excellent sense for both tempo and phrasing, always articulating with clarity and a flexible means of expression. You won't find her performances stiff or dull, or without passion or commitment. Indeed, try any of her second movement fugues in the sonatas: the massive fugue in the third sonata, to cite perhaps the most daunting one, brims with vitality and elegance, and every layer in the many complexities emerges clearly and convincingly. The sound reproduction is excellent. Highly recommended.